Laughter and excitement filled Morrill Hall on May 1, 2018 as esteemed Cornell alum Mr. Michael “Mike” Zak ’75 visited current CAPS students and faculty. Mr. Zak, a former Captain in the U.S. Marine Corps and current member of both the National Committee on U.S.-China Relations as well as the Pacific Council on International Policy, was the impetus behind creating the China Asia-Pacific Studies major and minor. With a notebook and pen in hand, Mr. Zak excitedly listened and asked questions about the experiences of current CAPS students. 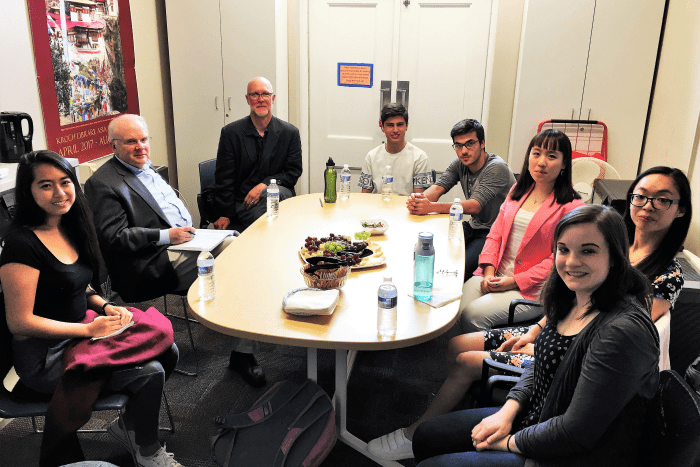 The hour-long meeting went by rather quickly, as the conversation drifted from students’ introduction to U.S.-China relations, as well as Mr. Zak’s experiences. He said that the China related courses he took, including two years of Mandarin Chinese, was equal to the modern-day CAPS minor. The students’ experiences were extremely insightful and their comments on CAPS classes and Cornell’s Mandarin Chinese program were overwhelmingly positive. Yet, some CAPS majors were also extremely influenced by their meet with Mr. Zak. Shauna Hwang ’19 beamed, “It was an honor and thrill to meet the person who made CAPS possible. I can’t begin to describe the emotions that come from getting to know someone who has played such a great role in making me who I am today.” Hwang and Zak also had special traits in common, as they both were active in Cornell’s Reserve Officers’ Training Corps (ROTC) for Air Force and Marines, respectively. After he finished asking questions about the CAPS and Chinese language programs, Mr. Zak asked the students a bit about their opinions on current issues in China-U.S. relations, such as Taiwan and the Trump administration’s approach to China. In a separate meeting with faculty, Mr. Zak recalled his insights about China from his time as a Cornell student to the present. In contrast to the faculty and his fellow classmates at Cornell in the 1970’s, Mr. Zak predicted that China would re-emerge as a world power, an insight which Professor Xu Xin found particularly interesting. Even in 2018, Mr. Zak recognizes that the American public needs to shift its attitude towards China in order to create a truly beneficial relationship. That, in part, was Mr. Zak’s motivation for donating to CAPS years ago. The CAPS program would like to collectively thank Mr. Michael Zak for his continued support and contributions to the program’s success and hope he enjoyed his visit at Cornell!